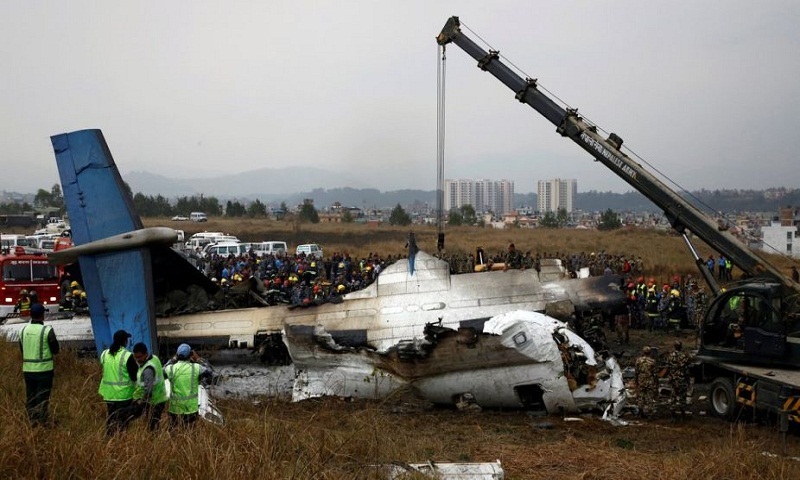 The death toll in the US-Bangla Airlines plane crash in Nepal climbed to 51 after two more people succumbed to injuries in a hospital here on Tuesday as the Nepali government formed a probe panel to investigate the aviation disaster, reports Ians. The Nepali Home Ministry said in a press release that 22 Nepalis, 28 Bangladeshis and a Chinese passenger lost their lives in Monday’s accident — the worst in the Himalayan nation since a 1992 Pakistan International Airlines (PIA) crash that claimed 167 lives. The injured were receiving treatment at various hospitals in Nepal. There were 71 passengers, including four crew members on board when the ill-fated aircraft crashed on Monday while landing at Kathmandu’s Tribhuvan International Airport (TIA). Investigators retrieved the flight data recorder from the wreckage of the plane. The aircraft caught fire when it narrowly escaped hitting the tail of a Thai Airways plane parked along the runway. The ill-fated plane was said to have circled the airport twice before trying to land, the Kathmandu Post reported. According to preliminary findings, the 78-seater Bombardier Dash 8 aircraft crashed due to a communication error between the cockpit and the control tower. The airline and airport authorities blamed each other for the disaster. While the airline blamed air traffic control, the airport said the plane landed from the wrong direction due to pilot’s “missed approach”. Environment Minister Lal Babu Pandit told the media that a probe panel — to be headed by former Secretary Yagya Prasad Gautam — had been formed to investigate the aviation disaster. Meanwhile, relatives of the Bangladeshi victims of the plane crash arrived here to identify their kin. “One of our flights already reached Kathmandu with 46 relatives and family members of victims and officials. We are now working on bringing the bodies back home and ensuring medical treatment for injured victims,” a spokesman for the US-Bangla Airlines, Kamrul Islam, said. Bangladesh’s Minister for Civil Aviation and Tourism A.K.M. Shahjahan Kamal and Foreign Minister Abul Hassan Mahmood Ali were in Nepal taking stock of the situation. Two officials from Bangladesh’s Ministry of Planning, who were travelling to Nepal for a regional symposium on ecosystem services and poverty alleviation in South Asia, were among the dead. Meanwhile, the Kathmandu-based Secretariat of the South Asian Association for Regional Cooperation (Saarc) conveyed condolences to the peoples and governments of Bangladesh and Nepal over the loss of lives in the horrific accident.